Yishan McNabb is back again! This Duelist from Alameda is a bit famous for his Feature Match a year ago, where he used his Gren Maju Da Eiza Deck, capable of throwing out some crazy amounts of damage thanks to Pot of Desires and Eater of Millions boosting his signature monster. His opponent is a Santa Ana Duelist, Jonathon Castillo. Castillo’s using the Danger! Dark World FTK strategy, looking to put together a combo to allow him to loop the effect of Cannon Soldier repeatedly for the win. Castillo won the dice roll and played first. He started with Allure of Darkness, banishing Danger! Chupacabra!. He Set one card in his back row, and activated Danger! Dogman! from his hand. he discarded Danger!? Jackalope?, Special Summoned Dogman, and drew a card. Jackalope’s effect Special Summoned Danger!? Tsuchinoko?. He activated Danger! Nessie! from his hand next, discarding Snoww, Unlight of Dark World. He Special Summoned Nessie, and Snoww added Grapha, Dragon Lord of Dark World to his hand. He played another Allure of Darkness, banishing a Snoww. He Normal Summoned Armageddon Knight, sending Cannon Soldier to the Graveyard. A third Allure of Darkness came down, banishing another Chupacabra. 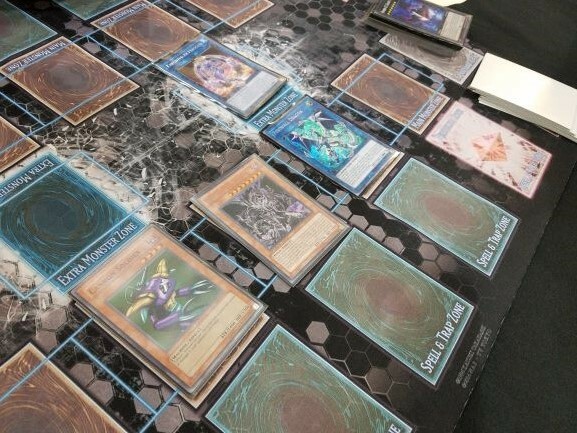 He used Tsuchinoko, Dogman, and Armageddon Knight to play Curious, the Lightsworn Dominion, sending Blackwing – Zephyros the Elite to the Graveyard. Curious sent Soul Charge, Tsuchinoko, and Broww, Huntsman of Dark World to the Graveyard with its other effect. Castillo flipped up The Beginning of the End to draw three cards, then Set another back row card. He activated Nessie from his hand, discarding Grapha. He Special Summoned Nessie and drew a card. He activated Chupacabra from his hand next, discarding Broww. He Special Summoned the Chupacabra and drew a total of two cards. He activated Danger! Mothman! next, discarding Snoww. He Special Summoned Mothman and drew a card, then added Broww to his hand. He bounced Chupacabra to his hand for Zephyros, and used it with Mothman to play Outer Entity Nyarla, and used that to play Outer Entity Azathot. He used the two Nessies to play Number 42: Galaxy Tomahawk, and Special Summoned three Battle Eagle Tokens. 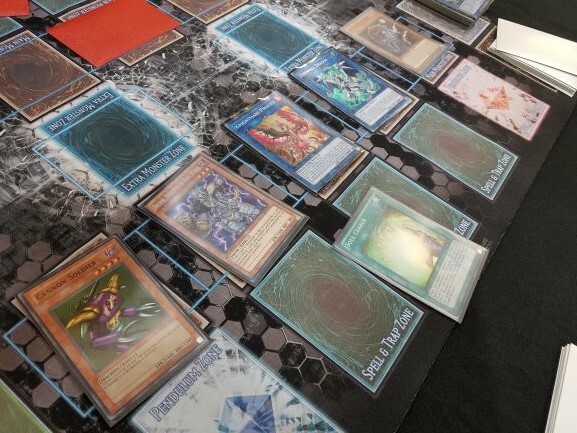 He Link Summoned using Azathot and a Token to play Knightmare Phoenix, and another Token with Curious to play Firewall Dragon. Firewall returned Cannon Soldier from his Graveyard to his hand. He used Knightmare Phoenix to Link Summon Knightmare Mermaid, and Firewall Special Summoned the Cannon Soldier. Cannon Soldier Tributed Galaxy Tomahawk for 500 damage, and Firewall Special Summoned Broww. He returned Broww to his hand to Special Summon Grapha from the Graveyard. Cannon Soldier Tributed Grapha to deal 500 damage, and Firewall Special Summoned Broww. Grapha bounced Broww again, Cannon Soldier Tributed it again, and Firewall Special Summoned Broww again. With this combo, Castillo took out McNabb’s Life Points on the first turn! McNabb had a hand of One Day of Peace, Battle Fader, Scapegoat, and two copies of Gren Maju Da Eiza. Against a normal opponent, this would have kept him safe for several turns, but it could do nothing against Cannon Soldier’s effect damage. The Duelists moved to their Side Decks. McNabb had Battle Fader, Fairy Tail – Snow, Shared Ride, Gold Sarcophagus, and Radian, the Multidimensional Kaiju. He started with Gold Sarcophagus, banishing Pot of Desires. He Set Shared Ride and Snow. Castillo played Allure of Darkness, banishing Chupacabra. He played Armageddon Knight to send Zephyros to the Graveyard. He Set one back row card and activated Chupacabra from his hand, discarding the Chupacabra. He activated Mothman next, discarding Broww. He Special Summoned Mothman and drew a card, and Broww gave him another card. Allure of Darkness banished Dogman and gave him two fresh cards. He bounced Mothman to Special Summon Zephyros, and activated Dogman from his hand. He discarded Broww, and Special Summoned the Dogman and drew two total cards. He used Zephyros and Armageddon Knight to play Nyarla, and that to play Azathot. He activated Card Destruction! He triggered Jackalope and Mothman, and Special Summoned Tsuchinoko, then both players drew a card and discarded. Castillo drew Tsuchinoko and Special Summoned it. He activated Nessie and discarded it, and McNabb Chained Shared Ride. Nessie searched for Chupacabra. He used Dogman, Tsuchinoko, and Azathot to play Curious, the Lightsworn Dominion, sending Cannon Soldier to the Graveyard. Then, it sent Nessie, Grapha, and Mothman to the Graveyard. Castillo flipped up The Beginning of the End to draw three cards. He activated Dogman, discarding Dogman itself. He used Chupacabra next, discarding Armageddon Knight. He Special Summoned Chupacabra and drew a card. He played another copy of The Beginning of the End, drawing three additional cards. Tsuchinoko and Chupacabra were used to play Knightmare Phoenix, then he activated Soul Charge! He Special Summoned Cannon Soldier, Broww, Nessie, and Dogman. He used Nessie and Curious to play Firewall Dragon, and bounced Broww to bring Grapha from the Graveyard, and started the combo once again! Jonathon Castillo pulls off a turn one knockout on each Duel, with Danger! Dark World!